Free Top-75 Articles E-Book! Help Us Celebrate 7,500 Subscribers! Welcome back from summer (to most), and welcome to the busy fall/winter litigation season. This blog, The Litigation Consulting Report, is now just about 4 ½ years old. In that time, we have written nearly 500 posts on dozens of trial and presentation-related subjects, including everything from TED talks to Reptile trial techniques to voir dire best-practices. We've earned accolades, won awards, won countless trials, and we have steadily grown our number of subscribers year after year, and I'm especially thrilled to say that we've just signed up our 7,500th blog subscriber! Every subscription is free, and perhaps that is part of the reason it took us less than a year to grow our community from 5,000 subscribers in September 2014 to 7,500 subscribers in September 2015 — a 50% increase. To celebrate reaching 7,500 blog subscribers, today we’re publishing (as a free download) this collection of our very best articles to date called, A2L Consulting's Top 75 Articles of All Time. By "very best," I mean that our readers have, by choosing which articles they read most, told us which articles they think are the best. On the Web, your clicks are your votes. We’re thrilled to receive this feedback from you.Many of these articles are geared toward lawyers going to trial, while others are more generally focused on how to give a great speech or presentation. For lawyers and others in the legal industry, we generally write about litigation consulting, litigation graphics, trial strategy and trial technology. For those outside the legal arena, we write about visual persuasion, delivering a great speech and how best to prepare for a PowerPoint presentation. Some of these articles have been read more than 30,000 times, and we credit this readership with having helped The Litigation Consulting Report be named one of the top 100 blogs in the legal industry and one of the top 10 litigation blogs by the American Bar Association. As a result, our A2L's blog reader demographics isarefascinating, and we continue to make improvements to our blog each and every month. I hope that you enjoy these articles. There’s really nothing else like them, and we look forward surpassing 10,000 subscribers soon. 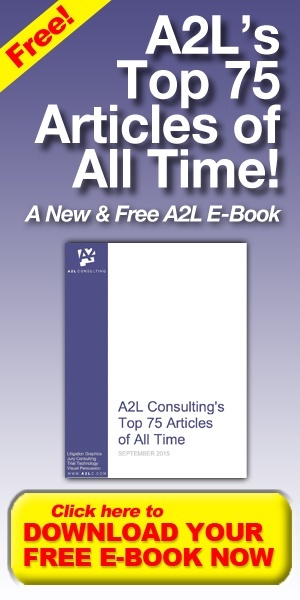 Click here or on the images below to download your Top 75 A2L Consulting Articles of All Time Free E-Book!